Contrails (/ˈkɒntreɪlz/; short for "condensation trails") or vapor trails are line-shaped clouds sometimes produced by aircraft engine exhaust, typically at aircraft cruise altitudes several miles above the Earth's surface. Contrails are composed primarily of water, in the form of ice crystals. The combination of water vapor in aircraft engine exhaust and the low ambient temperatures that often exists at these high altitudes allows the formation of the trails. Impurities in the jet exhaust from the fuel, including sulfur compounds (0.05% by weight in jet fuel) provide some of the particles that can serve as sites for water droplet growth in the exhaust and, if water droplets form, they might freeze to form ice particles that compose a contrail. Their formation can also be triggered by changes in air pressure in wingtip vortices or in the air over the entire wing surface. Depending on the temperature and humidity at the altitude the contrails form, they may be visible for only a few seconds or minutes, or may persist for hours and spread to be several miles wide, eventually resembling natural cirrus or altocumulus clouds. Persistent contrails are of particular interest to scientists because they increase the cloudiness of the atmosphere. The resulting cloud forms may resemble cirrus, cirrocumulus, or cirrostratus, and are sometimes called cirrus aviaticus. Persistent spreading contrails are thought by some, without overwhelming scientific proof, to have a significant effect on global climate. The main products of hydrocarbon fuel combustion are carbon dioxide and water vapor. At high altitudes this water vapor emerges into a cold environment, and the local increase in water vapor can raise the relative humidity of the air past saturation point. The vapor then condenses into tiny water droplets which freeze if the temperature is low enough. These millions of tiny water droplets and/or ice crystals form the contrails. The time taken for the vapor to cool enough to condense accounts for the contrail forming some way behind the aircraft's engines. At high altitudes, supercooled water vapor requires a trigger to encourage deposition or condensation. The exhaust particles in the aircraft's exhaust act as this trigger, causing the trapped vapor to condense rapidly. Exhaust contrails usually form at high altitudes; usually above 8,000 m (26,000 ft), where the air temperature is below −36.5 °C (−34 °F). They can also form closer to the ground when the air is very cold and has enough moisture. As a wing generates lift, it causes a vortex to form at each wingtip, and sometimes also at the tip of each wing flap. (Both wingtips and flap-boundaries are discontinuities in airflow.) 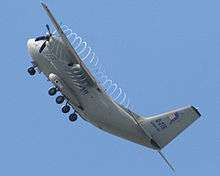 These wingtip vortices persist in the atmosphere long after the aircraft has passed. The reduction in pressure and temperature across each vortex can cause water to condense and make the cores of the wingtip vortices visible. This effect is more common on humid days. Wingtip vortices can sometimes be seen behind the wing flaps of airliners during takeoff and landing, and during landing of the Space Shuttle. During high-thrust settings the fan blades at the intake of a turbofan engine reach transonic speeds, causing a sudden drop in air pressure. This creates the condensation fog (inside the intake) which is often observed by air travelers during takeoff. For more information see the Prandtl-Glauert singularity effect. C-27J Spartan with propeller tip vortices condensation. Contrails, by affecting the Earth's radiation balance, act as a radiative forcing. Studies have found that contrails trap outgoing longwave radiation emitted by the Earth and atmosphere (positive radiative forcing) at a greater rate than they reflect incoming solar radiation (negative radiative forcing). NASA conducted a great deal of detailed research on atmospheric and climatological effects of contrails, including effects on ozone, ice crystal formation, and particle composition, during the Atmospheric Effects of Aviation Project (AEAP). Global radiative forcing has been calculated from the reanalysis data, climatological models and radiative transfer codes. It is estimated to amount to 0.012 W/m2 (watts per square meter) for 2005, with an uncertainty range of 0.005 to 0.026 W/m2, and with a low level of scientific understanding. Therefore, the overall net effect of contrails is positive, i.e. a warming effect. However, the effect varies daily and annually, and overall the magnitude of the forcing is not well known: globally (for 1992 air traffic conditions), values range from 3.5 mW/m2 to 17 mW/m2. Other studies have determined that night flights are mostly responsible for the warming effect: while accounting for only 25% of daily air traffic, they contribute 60 to 80% of contrail radiative forcing. Similarly, winter flights account for only 22% of annual air traffic, but contribute half of the annual mean radiative forcing. A 2015 study found that artificial cloudiness caused by contrail "outbreaks" reduce the difference between daytime and nighttime temperatures. The former are decreased and the latter are increased, in comparison to temperatures the day before and the day after such outbreaks. On days with outbreaks the day/night temperature difference was diminished by about 6 °F in the U.S. South and 5 °F in the Midwest. Condensation trails have been suspected of causing "regional-scale surface temperature" changes for some time. Researcher David J. Travis, an atmospheric scientist at the University of Wisconsin-Whitewater, wrote in the science journal Nature that the effect of the change in aircraft contrail formation during the three days after the September 11th attacks was observed in surface temperature change, measured across over 4,000 reporting stations in the continental United States. Travis' research documented an "anomalous increase in the average diurnal temperature change". The diurnal temperature range (DTR) is the difference in the day's highs and lows at any weather reporting station. Travis observed a 1.8 °C (3.24 °F) departure from the two adjacent three-day periods to September 11–14. This increase was the largest recorded in 30 years, more than "2 standard deviations away from the mean DTR". The September 2001 air closures are deeply unusual in the modern world, but similar effects have provisionally been identified from Second World War records, when flying was more tightly controlled. A 2011 study of climate records in the vicinity of large groups of airbases found a case where contrails appeared to induce a statistically significant change in local climate, with a temperature variance around 0.8 °C, suggesting that examination of historic weather data could help study these effects. A contrail from an airplane flying towards the observer can appear to be generated by an object moving vertically. On November 8, 2010 in California, U.S., a contrail of this type gained wide media attention as a "mystery missile" that could not be explained by U.S. military and aviation authorities, and its explanation as a contrail took more than 24 hours to become accepted by U.S. media and military institutions. A distrail is the opposite of a contrail. This photograph of a distrail was taken on November 22, 2012 in Hong Kong. Where an aircraft passes through a cloud, it can clear a path through it; this is known as a distrail (short for "dissipation trail"). The plane's warm engine exhaust causes existing water droplets to evaporate, leaving a clear wake through an otherwise cloudy sky. Clouds form when invisible water vapor ( H2O in gas phase) condenses into microscopic water droplets ( H2O in liquid phase) or into microscopic ice crystals ( H2O in solid phase). This may happen when air with a high proportion of gaseous water cools. A distrail forms when the heat of engine exhaust evaporates the liquid water droplets in a cloud, turning them back into invisible, gaseous water vapor. Airliner contrails, some new, some old and much spread out by wind shear. Contrail spread out by upper winds, Manchester, England, May 13, 2010. Iridescent contrails from a Boeing 747. This effect happens when water molecules interact with the aircraft and the sun shines through them. 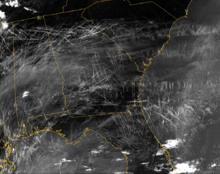 MODIS tracking of contrails generated by air traffic over the southeastern United States on January 29, 2004. 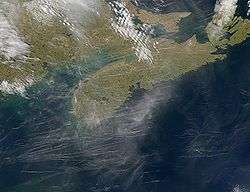 Multiple contrails above Nova Scotia. 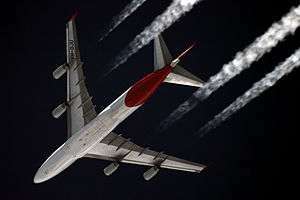 A Boeing 747 of Japan Airlines displays contrails. A Contrail over North-West Punjab. 1 2 3 "Aircraft Contrails Factsheet" (PDF). FAA.Gov. Retrieved 13 October 2015. ↑ "vapour trail". Encyclopædia Britannica. Encyclopædia Britannica Inc. 2012. Retrieved 17 April 2012. ↑ "Photos from the field" page 39 Vertical Magazine, April/May 2014. Accessed: 8 July 2014. ↑ Lee, D.S. ; D.W. Fahey; P.M. Forster; P.J. Newton; R.C.N. Wit; L.L. Lim; B. Owen; R. Sausen (2009). "Aviation and global climate change in the 21st century". Atmos. Environ. : 43 - Abstract. ↑ Ponater, M.; S. Marquart; R. Sausen; U. Schumann (2005). "On contrail climate sensitivity". Geophysical Research Letters. 32 (10): L10706. Bibcode:2005GeoRL..3210706P. doi:10.1029/2005GL022580. Retrieved 2008-11-21. ↑ Stuber, Nicola; Piers Forster; Gaby Rädel; Keith Shine (2006-06-15). "The importance of the diurnal and annual cycle of air traffic for contrail radiative forcing". Nature. 441 (7095): 864–867. Bibcode:2006Natur.441..864S. doi:10.1038/nature04877. PMID 16778887. ↑ Bernhardt, J. & Carleton, A.M. (2015). The impacts of long-lived jet contrail ‘outbreaks’ on surface station diurnal temperature range. Jrnl of Int'l Climatology. Online-early (July). ↑ Jet contrails affect surface temperatures. Science Daily. June 18, 2015. ↑ Travis, D.J. ; A.M. Carleton; R.G. Lauritsen (March 2004). "Regional Variations in U.S. Diurnal Temperature Range for the 11–14 September 2001 Aircraft Groundings: Evidence of Jet Contrail Influence on Climate" (PDF). J. Clim. 17 (5): 1123–1134. Bibcode:2004JCli...17.1123T. doi:10.1175/1520-0442(2004)017<1123:RVIUDT>2.0.CO;2. ISSN 1520-0442. Retrieved 2008-11-06. 1 2 3 4 5 Travis, D.J. ; A. Carleton; R.G. Lauritsen (August 2002). "Contrails reduce daily temperature range". Nature. 418 (6898): 601. Bibcode:2002Natur.418..601T. doi:10.1038/418601a. PMID 12167846. ↑ Only partial content available on-line. Reed, Christina (September 2006). "Hot Trails". Scientific American. news scan. 295 (3): 28. doi:10.1038/scientificamerican0906-28. ISSN 0036-8733. OCLC 1775222. Archived from the original on 19 March 2011. Retrieved 21 September 2009. ↑ Ryan, A. C.; MacKenzie, A. R.; Watkins, S.; Timmis, R. (2012). 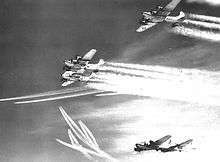 "World War II contrails: A case study of aviation-induced cloudiness". International Journal of Climatology. 32 (11): 1745. Bibcode:2012IJCli..32.1745R. doi:10.1002/joc.2392. 1 2 McKee, Maggie (2010-11-09). "Mystery 'missile' likely a jet contrail, says expert". New Scientist. Archived from the original on 2010-11-09. Retrieved 2010-11-10. 1 2 West, Mick (2010-11-10). "A Problem of Perspective – New Year's Eve Contrail". Archived from the original on 2010-11-10. Retrieved 2010-11-10. ↑ "Pentagon Can't Explain "Missile" off California". CBS. 2010-11-09. Archived from the original on 2010-11-10. Retrieved 2010-11-10. ↑ Pike, John E. (November 2010). "Mystery Missile Madness". GlobalSecurity.org. Retrieved 2010-11-11. ↑ Bahneman, Liem (2010-11-09). "It was US Airways flight 808". Archived from the original on 2010-11-10. Retrieved 2010-11-10. ↑ "Pentagon: 'Mystery missile' was probably airplane". Mercury News/AP. 2010-11-10. Archived from the original on 2010-11-10. Retrieved 2010-11-11. "Why Planes Make Vapor Trails". Popular Science. Bonnier Corporation. 142 (3): 55. March 1943. ISSN 0161-7370.